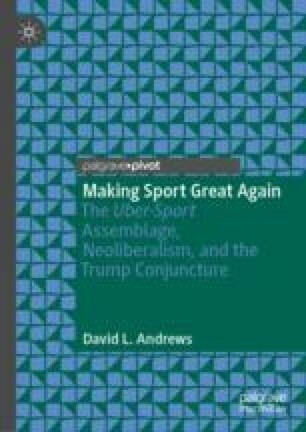 This chapter provides an on overview of the focus of the book’s primary focus: examining the relationship between sport and politics in the contemporary U.S. It introduces uber-sport as the project’s primary object of study, and situates it as the sporting expression of a late capitalist society driven and defined by the processes of corporatization, commercialization, spectacularization, and celebritization. The discussion turns to the critical theory of the Frankfurt School as a way of explaining how uber-sport is reified; ascribed sense of independent materiality, which obscures the broader social, cultural, political, and economic forces shaping the structure and experience of uber-sport. Adorno’s, Horkheimer’s, and Marcuse’s respective theories of consumer capitalism are used in identifying uber-sport as a culture industry reinforcing the practices and values of late capitalist society. Bogage, J. (2017). Youth sports study: Declining participation, rising costs and unqualified coaches. The Washington Post. Retrieved from https://www.washingtonpost.com/news/recruiting-insider/wp/2017/09/06/youth-sports-study-declining-participation-rising-costs-and-unqualified-coaches/?utm_term=.0a108c06fbbd. Burneko, A. (2018, September 18). The New Yorker looks to a stupid man to answer an even stupider question. Retrieved from https://deadspin.com/the-new-yorker-looks-to-a-stupid-man-to-answer-an-even-1829120337. Lansner, J. (2017). Don’t blame Trump: Sports is why sports ratings are down. The Orange County Register. Retrieved from https://www.ocregister.com/2017/02/26/dont-blame-trump-sports-is-why-sports-ratings-are-down/. Layden, T. (2018). It’s time we realize football is a little less important. Sports Illustrated. Retrieved from https://www.si.com/nfl/2018/08/23/football-player-safety-jordan-mcnair-death-maryland-urban-meyer-zach-smith-ohio-state-punishment. McCrum, R. (2018, May 14). Behold, America review: The fight for the American dream. The Guardian. Retrieved from https://www.theguardian.com/books/2018/may/14/behold-america-sarah-churchwell-review-fight-for-american-dream. McRae, D. (2018). Jaylen Brown: “Sport is a mechanism of control in America”. The Guardian. Retrieved from https://www.theguardian.com/sport/2018/jan/09/jaylen-brown-boston-celtics-nba-interview.